This guide contains possible sources for farming gold. "Conversational" means it's interactive and you can name additional sources or just discuss it. Of course, everything starts at 65 and below that, I do not think much about gold. To buy Tera gold seem to be the best selection. 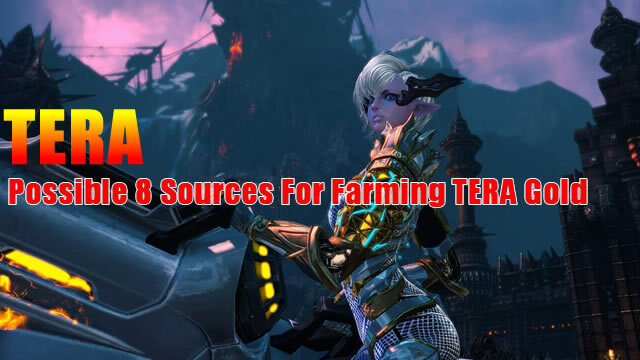 U4GM has been helping players improve their game playing by offering them cheap Tera gold and Tera items. To get even more out of the following, you can draw extra characters to 65 to make 100% more gold per character every day. Of course, this only pays off if you also play a few hours a day, so you can spend the time too. Depending on your equipment level, these will give you around 200 gold or more per quest. You can choose from many variations, but there is a daily limit of rewards. You can pick up 8x rewards per day (I'm not 100% sure what it's like to change with PvP or BAM quests, but for me, it has always been 8 daily). Thus, you can easily get 1500-2000 gold, depending on the equipment level. You get this as a reward for the vanguard Daily, who wants to benefit the most of it should only make the quests with the highest rewards on call coins. Story quests also give some, but they eventually go out. With the Call Coins, you can buy Niveot Crystals from Vanguard Initiative Merchant and sell them to the Trading Agent. You get them in each instance and get (click for the shop) things like Complete Crystal Binding that you can sell well to the trade agent. You get these regularly from instances (but only 65s in) and you can either sell them directly to the trading agent or open and hope for luck. From Lilita's box come often things that you can sell for more than the box price. It's only worth it if you already own Niveot structures and have lots of Cruxe left over. You then merge any 3 Cruxes (click on the structure or merge in the inventory) and then sell the Niveot. Structures are made of crystal boxes. If you do not need them anymore to turn them into high quality or for better accessories/glyphs, then you can buy crystal boxes with them. These either sell or open up and hope for structures or even private space. These essences come at the same time through the Daily vanguard initiative and through various instances. Even the 60s are worthwhile in the long term and if you make them swift, yet. You still get Elion's sign there, and you get fashion vouchers in every instance. Of course, you should only do the 60s when everyone else is in the cooldown and you have no other options for gold.